Twitter personality “Oum Haarith” is a propagandist for ISIS. 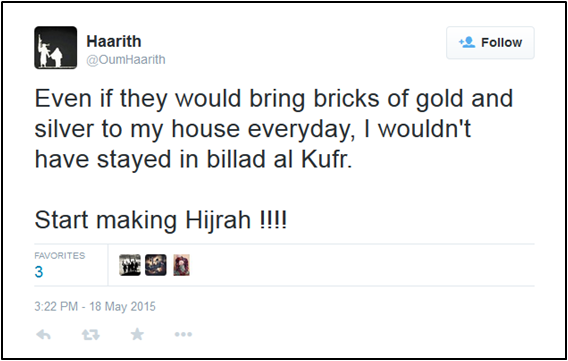 Purportedly a young woman living in ISIS-held territory, Haarith uses Twitter as a platform to broadcast her life under ISIS’s rule.Oum Haarith, Twitter, accessed June 15, 2015, https://twitter.com/OumHaarith. She has encouraged Twitter followers to perform what she and other jihadists refer to as hijrah (migration), an Islamic term employed by jihadists to encourage relocation and foreign fighting. In her Twitter feed, Haarith advocates migration to ISIS-held territory.Oum Haarith, Twitter post, May 18, 2015, 6:22 p.m., https://twitter.com/OumHaarith/status/600426238516338688. Haarith’s tweets appear aimed at giving her followers the sense that women in ISIS lead a social and (from her perspective) idyllic lifestyle. Haarith’s Twitter feed is populated with pictures of desserts and snacks.Oum Haarith, Twitter post, May 20, 2015, 7:37 a.m., https://twitter.com/OumHaarith/status/600988623526297601; Oum Haarith, Twitter post, May 20, 2015, 2:44 a.m., https://twitter.com/OumHaarith/status/600915010366414848; Oum Haarith, Twitter post, May 19, 2015, 10:23 a.m., https://twitter.com/OumHaarith/status/600668122014687232. She also frequently references other female friends and members of ISIS.Oum Haarith, Twitter, accessed June 15, 2015, https://twitter.com/OumHaarith. Many of Haarith’s tweets are publicized in tandem with Twitter cohorts “JustMuhajirah”Oum Haarith, Twitter post, May 25, 2015, 7:25 a.m.,, https://twitter.com/OumHaarith/status/602797747209695234. and “Ghareeba” (@AlMuhajiraah07).Oum Haarith, Twitter post, May 25, 2015, 12:37 p.m., https://twitter.com/OumHaarith/status/602876246029119488. The three accounts often allude to each other, and each personality claims to engage in activities with the others such as eating and baking.Oum Haarith, Twitter post, June 11, 2015, 7:10 a.m., https://twitter.com/OumHaarith/status/608954330142633984. In addition to marketing life in ISIS territory, Haarith frequently quotes extremist ideologues, including deceased al-Qaeda founders Osama bin LadenOum Haarith, Twitter post, May 23, 2015, 1:20 a.m., https://twitter.com/OumHaarith/status/601981088358080512. and Abdullah Azzam.Oum Haarith, Twitter post, May 23, 2015, 12:05 a.m., https://twitter.com/OumHaarith/status/601962132813516800. Haarith frequently propagates hate against kuffar (nonbelievers), purporting to do so in the name of Islam.Oum Haarith, Twitter post, May 21, 2015, 7:29 a.m., https://twitter.com/OumHaarith/status/601349106620112896. She also advocates a culture of death and martyrdom.Oum Haarith, Twitter post, June 3, 2015, 8:04 p.m., https://twitter.com/OumHaarith/status/606250117671342081. In Haarith’s Twitter description, she labels herself “Zawzjatu Shaheed,” widow of a martyr.Oum Haarith, Twitter, accessed June 15, 2015, https://twitter.com/OumHaarith; “ISIS Members Advertise Marital Status On Twitter,” Middle East Media Research Institute, June 3, 2015, http://www.memrijttm.org/isis-members-advertise-marital-status-on-twitter.html. While Haarith writes largely in English, she has occasionally posted in DutchOum Haarith, Twitter post, May 18, 2015, 2:27 a.m., https://twitter.com/OumHaarith/status/600185805399846912; Oum Haarith, Twitter post, May 18, 2015, 2:24 a.m., https://twitter.com/OumHaarith/status/600185274719670273. and referenced the Netherlands,Oum Haarith, Twitter post, May 22, 2015, 11:38 p.m., https://twitter.com/OumHaarith/status/601955454609141760; Oum Haarith, Twitter post, May 23, 2015, 10:53 a.m., https://twitter.com/OumHaarith/status/602125312537849856; Oum Haarith, Twitter post, May 19, 2015, 1:05 p.m., https://twitter.com/OumHaarith/status/600708792343461888. 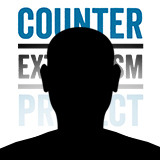 leading CEP to believe that Haarith may have come to ISIS-held territory from Holland. On Twitter, Haarith claims to operate out of ISIS-held Raqqa, Syria.Oum Haarith, Twitter, accessed June 15, 2015, https://twitter.com/OumHaarith; Oum Haarith, Twitter post, May 21, 2015, 4:20 a.m., https://twitter.com/OumHaarith/status/601301621713305601; Oum Haarith, Twitter post, May 20, 2015, 2:44 a.m., https://twitter.com/OumHaarith/status/600915010366414848. @OumHaarithOum Haarith, Twitter, accessed June 15, 2015, https://twitter.com/OumHaarith. Twitter personality “Oum Haarith” is a propagandist for ISIS. “Ya Allaah, Let their woman become widows like our woman became widows. Let their children become orphans like our children became orphans!” (Tweet)Oum Haarith, Twitter post, June 29, 2015, 11:12 a.m., https://twitter.com/OumHaarith/status/615764774316408832. “The month of Ramadan is the ideal time to train the nafs for supporting Jihad and fortifying its forces.” (Tweet)Oum Haarith, Twitter post, June 17, 2015, 10:25 a.m., https://twitter.com/OumHaarith/status/611223255567863808. 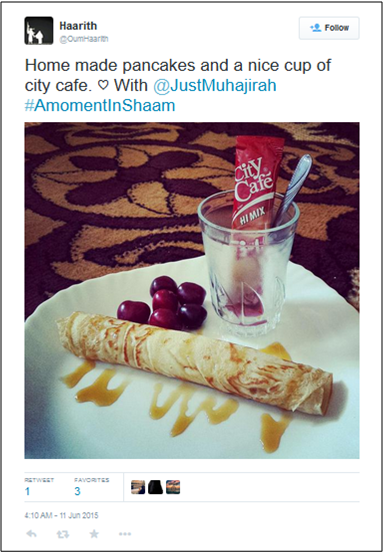 “Home made pancakes and a nice cup of city cafe. ♡ With @JustMuhajirah #AmomentInShaam”Oum Haarith, Twitter post, June 11, 2015, 7:10 a.m., https://twitter.com/OumHaarith/status/608954330142633984. “Celebrating the Shahada of my cousin. Allaahi taqabbal minnek. We are proud of you! !” (Tweet accompanied by pictures of desserts)Oum Haarith, Twitter post, June 3, 2015, 8:04 p.m., https://twitter.com/OumHaarith/status/606250117671342081. “Home made brownie without oven♡. You have to be creative in Shaam.” (Tweet accompanied by pictures of brownie)Oum Haarith, Twitter post, May 31, 2015, 4:14 a.m., https://twitter.com/OumHaarith/status/604923882798247936. “We gonna establish islam. We gonna dominate the whole world, from east to west.”Oum Haarith, Twitter post, May 29, 2015, 1:06 p.m., https://twitter.com/OumHaarith/status/604333106959683584. “While Julani [reference to Abu Mohammed al-Golani, leader of the Nusra Front] keeps talking trash and nonsens. Im enjoying my coldwater with lemon and mint. [thumbs up] with @JustMuhajirah” (Tweet accompanied by picture of drinks)Oum Haarith, Twitter post, May 27, 2015, 8:25 p.m., https://twitter.com/OumHaarith/status/603718431595229185. “O Mujahid, Go and find us that Jannah.”Oum Haarith, Twitter post, May 26, 2015, 8:04 a.m., https://twitter.com/OumHaarith/status/603169852564602880. “Uhhh, don't missing a thing. Enjoying The blessings of Khilafa! With my sis @AlMuhajiraah07” (Tweet accompanied by picture of iced tea, cookies, and yogurt)Oum Haarith, Twitter post, May 25, 2015, 12:37 p.m., https://twitter.com/OumHaarith/status/602876246029119488. “Khilafah and a Wilaya in Morocco one day.. How wonderful would that be? !...”Oum Haarith, Twitter post, May 23, 2015, 2:10 p.m., https://twitter.com/OumHaarith/status/602174719404679169. “The best place for the Woman is her own house and not Daouar Na'im with a Milkshake in ur hand. Sisters nowadays. A3udhubillah!”Oum Haarith, Twitter post, May 23, 2015, 12:38 a.m., https://twitter.com/OumHaarith/status/601970506301059073. “YES! We are here to Dominate! We'll take your houses, wealth and your lives. Just like u did to us! &YES we Hate you for His Sake! #ISLAM.”Oum Haarith, Twitter post, May 21, 2015, 7:29 a.m., https://twitter.com/OumHaarith/status/601349106620112896. “O My Sister, when ur Husband is Blessed with the Shahada, Dont Scream and Cry. Be Happy and Thankful. Cause Allaah gave him what he Wanted! !”Oum Haarith, Twitter post, May 19, 2015, 12:33 p.m., https://twitter.com/OumHaarith/status/600700908146679808. “Rizq from ar Razzaq! Blessed food in shaa Allaah @ Ard al Khilafah.” (Tweet accompanied by pictures of food)Oum Haarith, Twitter post, May 18, 2015, 2:55 a.m., https://twitter.com/OumHaarith/status/600193087185498113.